To run, or not to run. Picture yourself running. You’re not going anywhere, and (hopefully) not running away from anything. You’re simply running… Running for the sake of running. Finally, imagine yourself loving it – captivated by each passing moment. For some people, that last bit may not seem plausible. 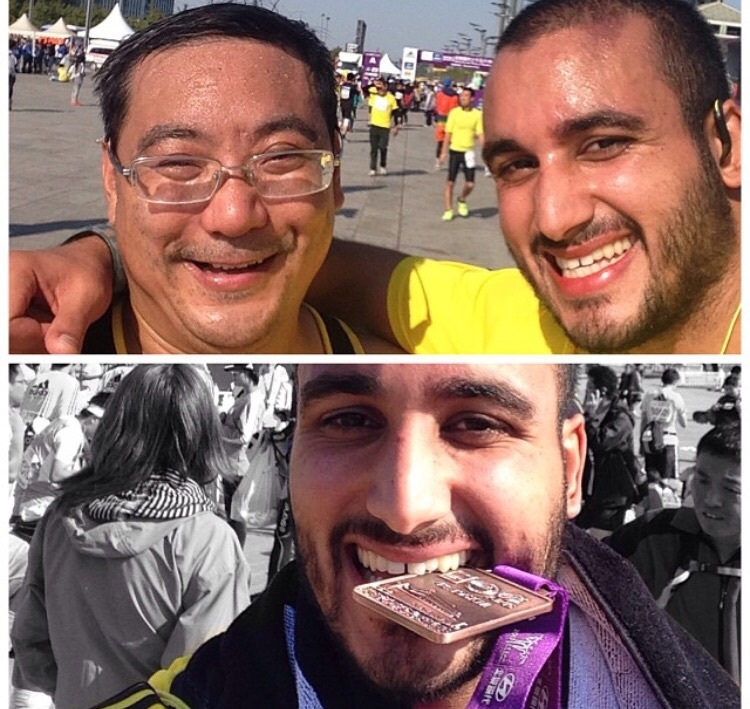 My first experience with endurance running was during my second year of university in Beijing. I had picked up some poor lifestyle habits and wasn’t satisfied with my physical condition. I decided to jump-start my body by signing up for the Beijing Marathon which was coming up in a couple of months. Throughout my childhood and up to my high school graduation, I’ve been very fortunate to have an aptitude to excel in a very wide array of sports. On a weekly basis, during my free time, I was involved in kickboxing, tennis, and motorsport activities. Running was obviously a large part of many of these sports but I never really drilled in on it. I naively assumed the marathon would be a walk in the park and that I might even set a great time. The day of the marathon had finally arrived, and by 6 am I was eagerly anticipating the start from Tiananmen Square. I squeezed myself between thousands of participants in order to get myself as close to the starting line as possible. I found myself within range of the professionals and somehow decided this was a good place to start. What happened after the starting gun went off was one of the most humbling experiences I’ve ever been through. I was off to a blistering start, maintaining a pace way too high. All the while, hundreds and hundreds of people were flying and disappearing into the distance. “It doesn’t matter”, I thought, certain that I’d catch up with them later on. The crowd was sensational, hundreds of people were gathering along the sides the course shouting out words of encouragement. “加油！加油！“。A little kid even handed me a banana! Soon afterwards, as the buzz of the crowds and that atmosphere began fading away – so did my speed. After reaching the half-marathon point, I realised what it meant to ‘hit the wall’. My legs, filled with a burning sensation, simply came to a solid halt. I was physically crushed. To make things even worse, now there were thousands of people (not hundreds) passing me. I became physically and mentally crushed. As a trotted along, I began looking for possible course exits so that I could quit and make my way home. I thought of giving up countless times, but something just didn’t let me. A group of women in the 60+ age group were running past, looking like they had just started. They were running bare-foot. Some of the other runners who passed were even wearing 20kg weight packs and funky super-hero costumes. Towards the last 12km, we had made it off the public roads into a park which was completely closed off. Suddenly everything became quiet, and trail seemed endless. That was it, I felt like I was going to pass out. Out of nowhere, a Chinese man tapped me on the back and said, “Come on, we’re going to keep going”, as if he was stating an obvious fact. We kept each other going till the very end, and I honestly wouldn’t have been able to make it without him. As we hit the 40km mark, he couldn’t run and told me to keep going. I’m sure he knew, deep down, that the only way we were going to cross the finish was side by side. It was an emotional journey, and it ignited a new-found passion. In one of my all-time favourite books, Born to Run, Christopher McDougall puts forth an interesting argument about how humans are biologically designed to run. Taking a glance at other species; reptiles, such as lizards, can’t even run and breathe simultaneously. Reptiles manage a quick dash before coming to a complete halt to pant. Case closed for them. Many mammals are great runners, but surprisingly all running mammals are restricted to a one-breath-per-stride cycle. (Say what?!) When animals run, their hind legs need to come together close to their front legs as they speed above the ground. That contracting motion pushes some internal organs into their lungs, forcing them to exhale. They are biologically limited to a one breath per locomotion cycle. There’s only once exception to the rule: You! When we run (vertically of course), our breathing system is completely disconnected from our legs, freeing us to breath at a number of different breaths per cycle ratios. Moreover, all the pelt-covered beings in the world cool of primary by breathing, which ties their heat-regulating system to their lungs. You’ll surely notice this the next time you go out with your dog on a hot day! We cool off differently, with our millions of sweat glands, making us the best air-cooled engine in nature. When a cheetah’s temperature hits about 40 degrees it has to come to a stop. When running mammals build up more heat in their bodies than they can puff out of their mouths they have two options; to stop or die. As long as we keep sweating, we can keep going! We have dense legs full of springy tendons, hairless skin with sweat glands, and vertical bodies that retain less sun heat especially during the scorching hot mid-day hours – when the sun is at its peak (plus hair on our heads to keep it cool – for some of most of us at least!). Endurance running is a sport where rules of the universe simply don’t apply. Not a single woman is ranked among the top fifty in the world when it comes to running a mile, and it’s rare to see a woman place among the top 30 of a marathon. However, when it comes to sheer endurance, the story’s plot changes dramatically. For example, ‘Leadville’ is one of the most prestigious and strenuous races on the planet. A 100 mile trail run. Every year, more than 90% of the female runners make it while 50% of the male runner come up with an excuse! How is this possible? In addition, researchers monitored the age of marathoners to find out how old you are when you’re back to running the same speed you did at 19 years of age? Sixty-four! Let me repeat that, running at the age of 19 is equivalent to running at 64. That’s a 45 year gap. Isn’t that incredible? Name any other sport where 64 year old are competing with teenagers? We’re machines built to run. For those of you willing to delve into the world of running, or take your running to the next level, feel free to subscribe to the blog to stay up to date. I’ll be posting some simple yet effective paradigm-shifting tips soon! Talk to you soon – gotta RUN! « The next chapter begins.